In this post, I will walk you through the creation of a custom widget to display the top 5 wait stats from your system but first you must have Azure Data Studio installed on your computer already. So in case you don’t please make yourself a favor and download the macOS version on this link. From now on, I will assume you have Azure Data Studio installed also a working connection to a SQL Server instance. 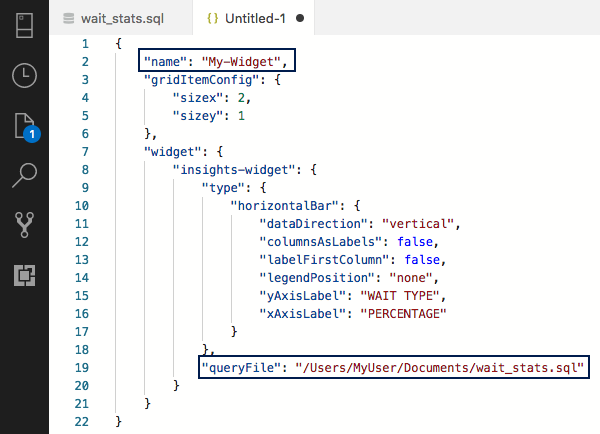 All the Azure Data Studio widgets uses a query file as a source, in this case I created a short version of world-famous Paul Randal’s (b|t) script to determine the wait stats for a SQL Server instance, you can download the modified script here from my GitHub repository. This short version will show only the top five wait types from your system, I also I removed the links from Paul’s version where he explains each ignored wait type just to make the code easier to read but I strongly recommend you to check Paul Randal’s blog post to learn more about. Download the script and move it to a known location rather than your Downloads folder, this will make things easier while creating the widget. A folder location like /Users/MyUser/Documents/wait_stats.sql would work. As you may noticed at this point, a nice horizontal bar type char is displayed on your screen, but this is just halfway now let’s move ahead and get the widget created. 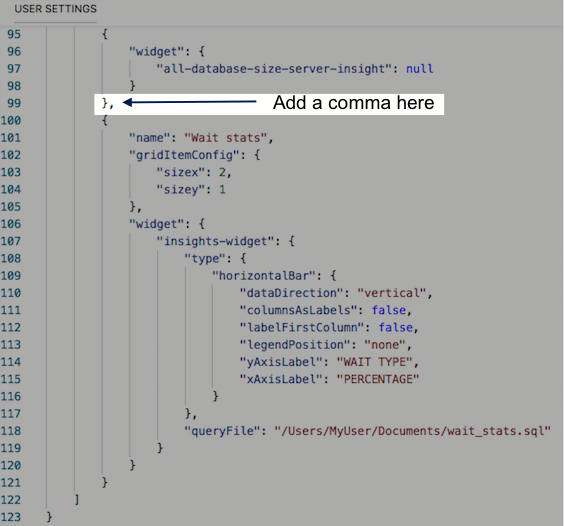 Click on the Create Insight button at the top of the RESULTS \ CHART grid to generate the JSON code for this chart. Noticed that I have highlighted the name key, because the auto-generated code puts My-Widget as value by default in our case we want to call this widget something like Wait stats, also noticed the queryFile key value it points the location you saved the wait stats script at the beginning of this post. 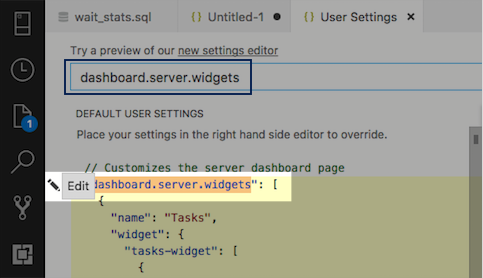 Finally it’s time to add our custom Wait stats widget to Azure Data Studio, open the Azure Data Studio command palette using the ? ?P (Command + Shift + P) and then write Preferences you will see a list of options displayed as a list choose Preferences: Open User Settings from the list. Then simply save the changes to the user settings using the ?S (Command + S) shortcut, close all the open windows. Re-connect to one of your SQL Server instances, right click then choose manage it will display the server dashboard now just look for the widget we just created. I hope you find this tip useful, in case you want to grab a copy of the SQL and JSON file used in this post you can find it here. Stay tuned for more DBA mastery tips! 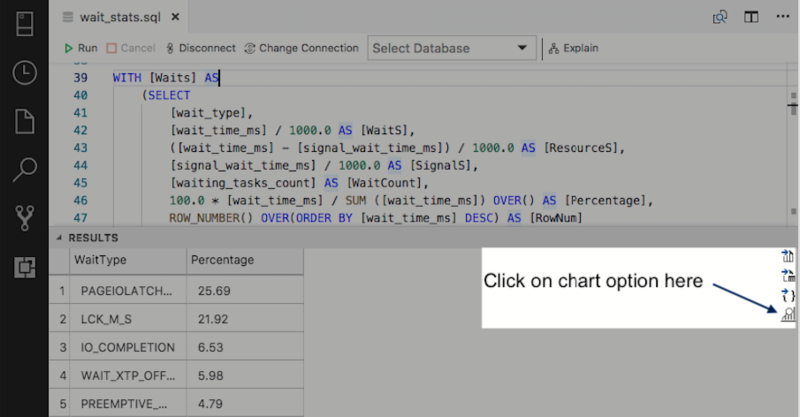 The post Creating Wait stats widget on Azure Data Studio for macOS appeared first on DBA MASTERY.